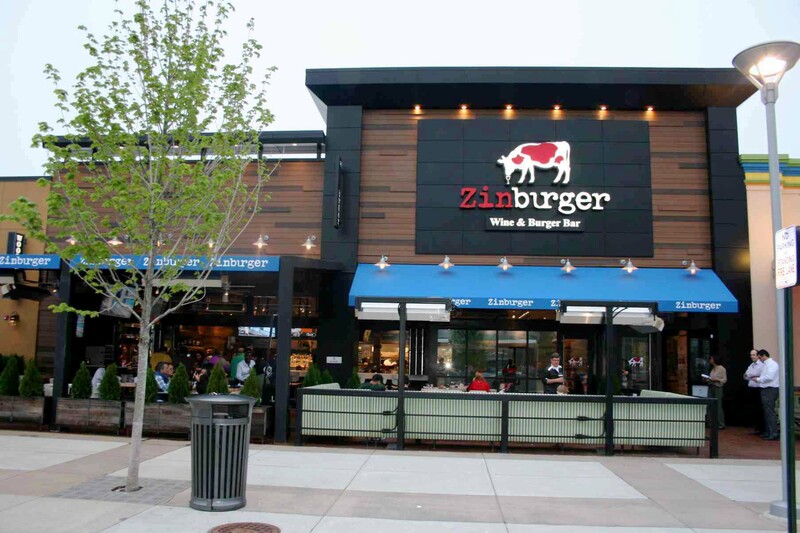 Zinburger Wine & Burger Bar became the latest restaurant to join the DMV’s burger battle that includes Five Guys Burgers, Z Burger, Smashburger, Shake Shack, Elevation Burger and others when it opened Tuesday, May 3, in the Springfield Town Center, 6795 Springfield Mall, Springfield, Va. The upscale burger joint serves made-to-order burgers, salads, sides, chili, milkshakes and pie, as well as, wines by the glass or bottle, cocktails and beer. The 5,700-square-foot location seats 291 inside and an additional 42 outside on a patio. It is part of Fox Restaurant Concepts, which also owns True Food Kitchen in Fairfax’s Mosaic District. The local burger outlet is owned by the New Jersey-based Baird Group, which operates the East Coast Zinburgers along with licensed franchises of Wendy’s, TGI Friday, Marriott and Hilton. Baird opened Zinburger’s first East Coast location in New Jersey five years ago. Zinburger’s décor features wood and earth tones. The restaurant has 14 high definition televisions. Inside, there’s a bigger-than-life Ben-and-Jerry’s-like mural of cows grazing on one wall, a chalkboard wall inside the front door that lists the monthly wine and shake specials along with the weekly burger special. Tables are butcher block with sleek, white modern chairs and olive green banquettes. Windows at the bar open onto a counter outside on the patio, which also has a fire pit, tables and lounge seating. All the burgers at are scratch-made and cooked to order on a griddle in their own juices. The certified Angus beef and American-style Kobe beef are ground fresh twice a day. Signature burgers include the Zinburger with Manchego cheese and zinfandel braised onions and the Kobe burger with Vermont cheddar and wild mushrooms. There are also turkey and vegetarian burgers, along with chicken and ahi sandwiches. Burgers and sandwiches range from $9.25-$12.25 and can be upgraded to Kobe style for $5. Diners can also create their own burgers by choosing from a list of cheeses and toppings for $1.25 each. Salads, which range from $5.25-$15.25 include chopped wedge, a kale Caesar, seared ahi and Chinese chicken. Sides are priced from $3-$7 and include coleslaw, mac and cheese, house-made onion rings, sweet potato fries, double truffle fries, zucchini fries, loaded fries with bacon, cheese sauce, sour cream and chives and spicy green chili fried with green chili sauce, roasted jalapenos, chipotle sauce, Cotja cheese and chives. Dessert includes hand-dipped shakes for $6 or fresh banana cream or chocolate cream pies for $5. Zinburger offers a full bar with cocktails, 24 beer selections including 16 on tap and local craft beers as well and a wine menu that includes 23 varieties priced from $5.50-$12.50 a glass or $21-$49 for bottles. On Wednesdays, guests can enjoy half-price bottles of wine. Happy Hour, weekdays from 3-6 p.m., features discounts on beer and cocktails, $5 Plain and Simple Burger and half-price sides. 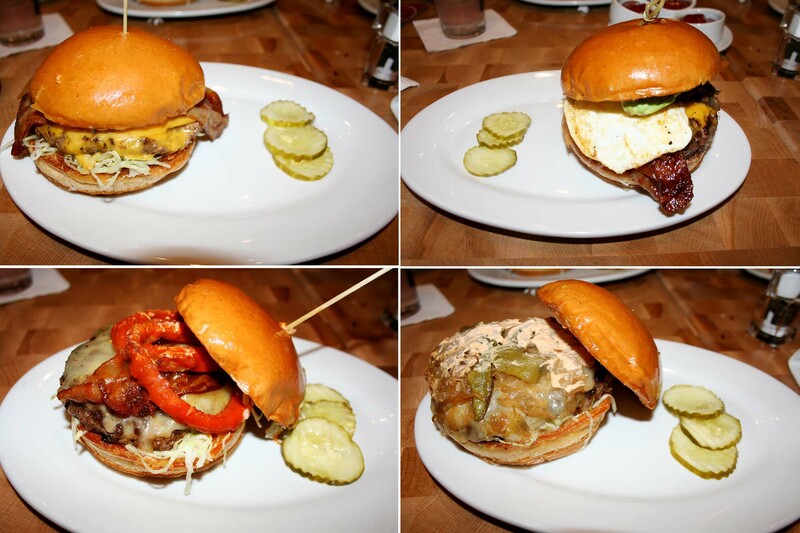 Burgers include the Sam burger (clockwise from top left), the breakfast burger, El Diablo and the Ringer with Frank’s Red Hot. The burgers are very tasty, although a bit pricey considering they are only served with three pickle slices. Sides are a la carte. 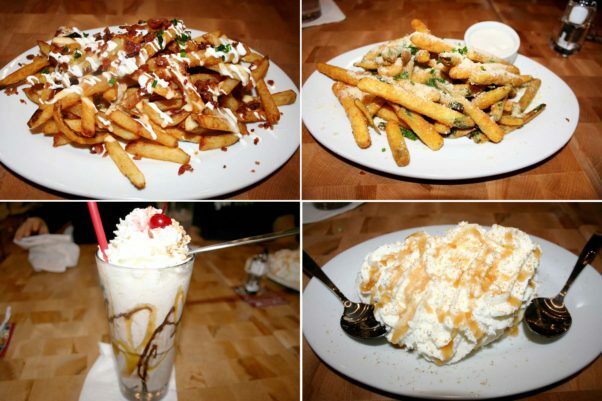 During a recent visit, my party of four sampled the loaded fries and zucchini fries along with the Sam Burger, with Applewood smoked bacon, American cheese, lettuce and 1,000 Island dressing; the Breakfast Burger with fried egg, Applewood smoked bacon, avocado, American cheese, lettuce and mayonnaise; the El Diablo with fried roasted jalapenos, pepper jack cheese, braised onions, lettuce and chipotle mayonnaise; and the Ringer with Applewood smoked bacon, Frank’s Red Hot sauce, onion rings, pepper jack cheese, lettuce and mayonnaise. I liked the breakfast burger with added mushrooms the best. The avocado was a nice addition to the common breakfast and the extra mushrooms added even more flavor. The El Diablo was also enjoyable through not too spicy with the braised onions and roasted jalapenos. The Ringer with the Frank’s Red Hot, however, did have some kick to it. The loaded fries on the other hand, weren’t that loaded, a bit stingy with the toppings. The fried zucchini, however, were the better choice with a nice crispy parmesan coating and ranch dressing for dipping. Both the milkshakes and pies are good choices to finish the meal. 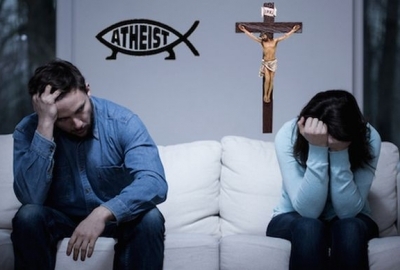 Both are big enough for at least two and maybe three people to share. The fresh banana cream pie was huge with slices of bananas in it. The banana royale shake with vanilla ice cream, banana, brown sugar caramel, Ghiradelli chocolate, fresh whipped cream, peanuts and a real cherry (not one of those sickeningly sweet maraschino cherries) on top. 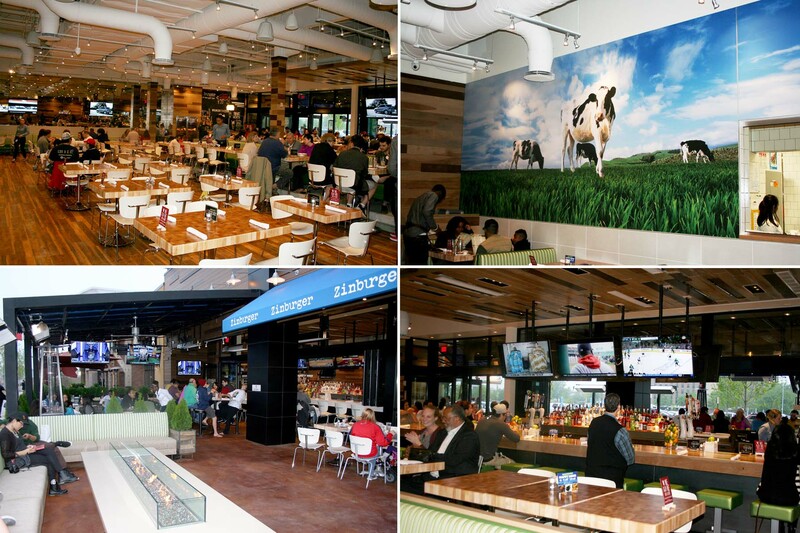 Zinburger is open from 11 a.m.-10 p.m. Sunday through Thursday and 11 a.m.-11 p.m. on Friday and Saturday.